Michael Connor | Tue Sep 22nd, 2015 12:30 p.m.
For his contribution to the ongoing online exhibition "Brushes," presented by Rhizome and the New Museum as part of the First Look series, artist Andrej Ujhazy presents a large-scale (70MB, 15120x7560 pixel) digital painting created in Adobe Photoshop, presented as a png file that can be viewed or downloaded here. Detail of Andrej Ujhazy, congress of the sarmatian women by the black sea to dissolve the amazonian tribes and withdraw from history, aug1 333 (after Total War: Atilla™).png (2015), Photoshop painting, 15120 × 7560 pixels. 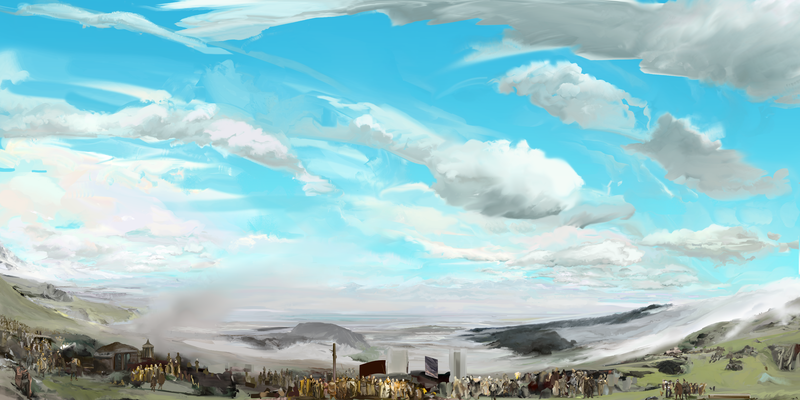 Andrej Ujhazy undertook this work while playing a video game from the Total War series that features massive armies fighting in grandiose landscapes during the late Roman Empire. Ujhazy set out to make an epic historical painting in the traditional sense, drawing inspiration from the videogame and from the underlying history it represented, but working from a contemporary cultural reference point. The tribe Ujhazy was playing in the game was the Sarmatians, a central Asian people for whom women played an important role in warfare; they were described by Herodotus as the descendants of Amazon mothers. Thus, the painting was partly an intervention into the narrative of the game and into videogame culture as a whole, emphasizing the role played by women in both. 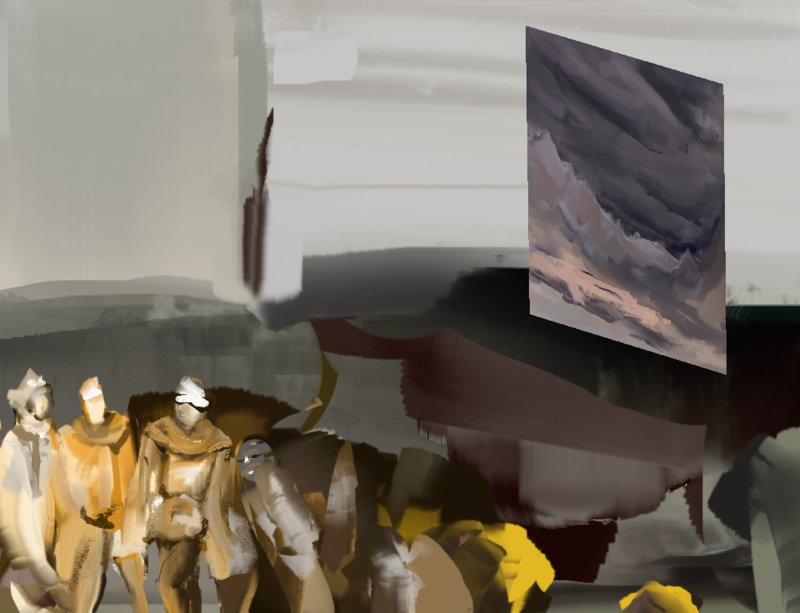 However, the work departs markedly from the game's photorealistic style, introducing gestural digital brushwork that bridges the gap between historical epic and personal expression, between the academic style often favored by online art communities that Ujhazy participates in and the language of gestural abstraction. Ujhazy's use of extreme scale turns the image into a kind of navigable virtual world. The image is best explored by zooming in to navigate through the many scenes and passages that unfold within it, and zooming back out again to understand how these elements relate to a pictorial whole. Thus, scale allows the painting to be experienced as a richly layered narrative. Whereas in Laura Brothers' work, a temporal dimension to the work is introduced via vertical scrolling on a serially updated blog, and in Cortright's via animated video and gif, the temporality of Ujhazy's painting is based on navigation through a still image. To view the 70MB work, click here. See more of Ujhazy's work at acidyblog.blogspot.com and bluzzard.tumblr.com. Roz Dimon | Thu, Sep 24th, 2015 4:29 p.m.